3D Space Harrier (3D スペースハリアー), not to be confused with Space Harrier 3D for the Sega Master System, is a downloadable conversion of Space Harrier for the Nintendo 3DS. 3D Space Harrier is mostly identical to the arcade version of Space Harrier, though has been altered to make use of the system's 3D capabilities, similar to Nintendo's 3D Classics range, also available for the platform. The visuals have also been adjusted for the console's 16:9 widescreen display. This version also uses the 3DS gyroscope to simulate the original arcade machine's hydraulic arcade cabinet movement, replicated for the first time on a home system. 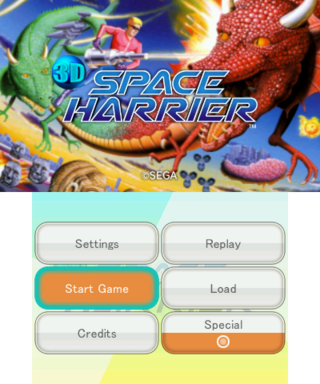 With the exception of a handful of Sega Game Gear Virtual Console titles, 3D Space Harrier stands as the first downloadable game for the 3DS to be provided by Sega. Main article: 3D Space Harrier/Magazine articles.